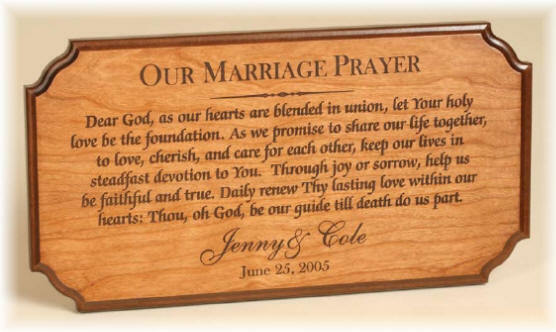 This high quality cherry finish plaque with a decorative corners features a lovely marriage prayer with the couples names and a date underneath if desired.. This cherry finished plaque is made in the USA and is hand finished and hand sanded to create a beautiful Marriage Prayer wall plaque that will be cherished for many years. Poem Reads: Dear God, as our hearts are blended in union, let your holy love be the foundation. As we promise to share our life together to love, cherish, and care for each other, keep our lives in steadfast devotion to you. Through joy or sorrow, help us be faithful and true. Daily renew Thy lasting love within our hearts; Thou, oh God, be our guide till death do us part.